Terrestrial laser scanning (TLS) was performed in tectonically undisturbed flysch in the Elerji quarry (south-west Slovenia), which represents heterogeneous rock mass with alternation of marlstone and sandstone beds. A 9.3-m-thick lithological profile was measured in detail and then compared to TLS values of reflected intensity and mineralogical composition of general marlstones and sandstones. The results showed distinguishable differences between the intensity values of marlstones and sandstones, as these two groups were found to be statistically different. It was also possible to discriminate these units with regard to their moisture content, as different values were observed for combinations of lithology and moisture content. Correlations of intensity and RGB (red, green, blue) values for the mineralogical composition of marlstones and sandstones revealed a good correlation of intensity with combined calcite and quartz content; however, such correlation is valid only for sandstones due to their bigger grain size. Larger quartz grains can scatter the laser beam and lower the correlation. The results showed that acquiring data from heterogeneous rock mass using TLS could be used for the geotechnical engineering classification of distant, inaccessible outcrops and excavated faces, based on the well-established RMR (Rock Mass Rating) and GSI (Geological Strength Index) rock mass classification systems. Both RMR and GSI classification systems classify rock mass based on rock composition, structure and surface conditions of discontinuities. Lithological segmentation of heterogeneous rocks presents, therefore, an important input parameter for their further classification. The research for using TLS for lithology logging of thin-bedded heterogeneous rock mass by analysing the intensity values of the reflected laser beam was performed between 2011 and 2016 as part of the Elea iC Research & Development group NTg2 (New Technologies in Geomatics and Geomechanics), which was co-financed by the European Union. The analysis included scanned faces of underground and ground excavations, like tunnel and quarry faces. 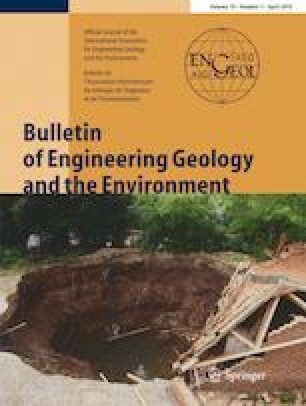 The authors express their thanks to Dr. Matej Dolenec for the performance of XRD analysis and DFG Consulting for supporting the performance and knowledge of terrestrial laser scanning.